Are you sick and tired of trying and failing at duplicating that crispy tempura they serve at your favorite Japanese restaurant? I finally have found the batter recipe that actually produces the bestest, crispiest, lightest tempura you will ever taste! Mix flour, starch and salt and slowly add seltzer. Beat it until everything is mixed well. Dip desired vegetables and shrimp and fry immediately in high heat, 2-3 minutes. Drain on paper towel. 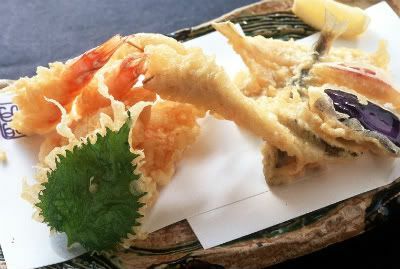 *The secret of the great tempura is pretty simple- freshness: you should prepare for it and serve it right away. The whole process should take only about 10-15 minutes. For a dipping sauce, I usually dilute regular soy sauce with water 2:1 ratio with half a tea spoon of sugar thrown in. Damn, you and the kitchen. It is a match made in heaven.